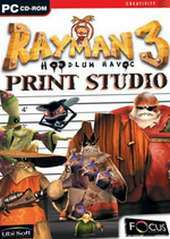 This is an interactive creativity package for the PC that was released to coincide with the major game of the same name. Unlike most PC software, it does not need to be installed, but still needs to be ran from the CD, and a printer is required for the user to print out their selected items. Using some of the Rayman 3 artworks provided, the user can choose to print a paper based item from five main categories: Greeting Cards; Writing Papers; Stickers and Name tags (preferably with the use of adhesive paper); Bookmarks and Door Hangers; Calendars (only the years 2003 and 2004 are available except for the version that comes with the PC version of the Rayman 10th Anniversary, which has the years 2006 and 2007). The user can then choose what artwork they'd like to use for their item, as well as messages and other writings (e.g. "Happy Birthday"). Depending on what type of item is chosen, the user may then have to construct it themselves with glue.